Deerfield Purple Garlic | Gurney's Seed & Nursery Co. Size, flavor and uniformity give this garlic an edge. 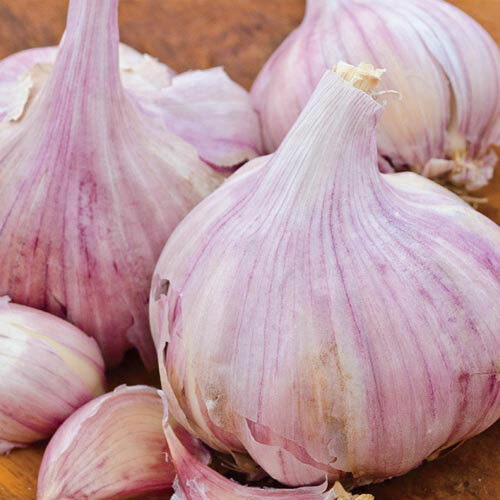 Attractive purple variety has large, meaty cloves and a rich garlic flavor that starts out mild and finishes with a spicy kick. Approx.7-10 cloves per bulb. Spacing2 - 4 inches apart, in rows 6 inches apart. ColorThin white, purple striped wrappers. Cloves are tan with purple streaks. Soil RequirementsWell-drained, loose, organic soil. CommentsStarts out with a mild flavor and finishes with spice. Wrappers have very attractive violet stripes. Very rich garlic fragrance, Large meaty bulbs. DepthDivide bulbs into cloves and set 1 - 2 inches deep; plant flat side down.